There are many of us who know and love bacon. Of course there are the few who don’t like it, but we are not going to talk about them. I think even though a lot of people know what bacon is and what it looks like they have never considered making it themselves. Because I don’t really purchase meat from the store, I typically purchase my bacon from Yonder Way Farm but theirs comes completely uncured and unsalted, in fact it’s simply fresh pork belly. Which technically makes it not actual bacon due to the fact that bacon is a cured and preserved meat. I was completely fine with that for a while because their pork is the best and so incredibly flavorful that it doesn’t really need to be cured. Alas my cravings for salty, piquant porky goodness began to arise so I sought to make my own. As some might not know, there are different types of bacon. The most commonly known in the United States is the one that I’m doing for this recipe which is made with pork belly but it can also be made with other cuts like loin, fatback, ankle, jowl, the list goes on and on. Each of course differing slightly in the use of ingredients but all of them have a general “bacony-ness” about them. 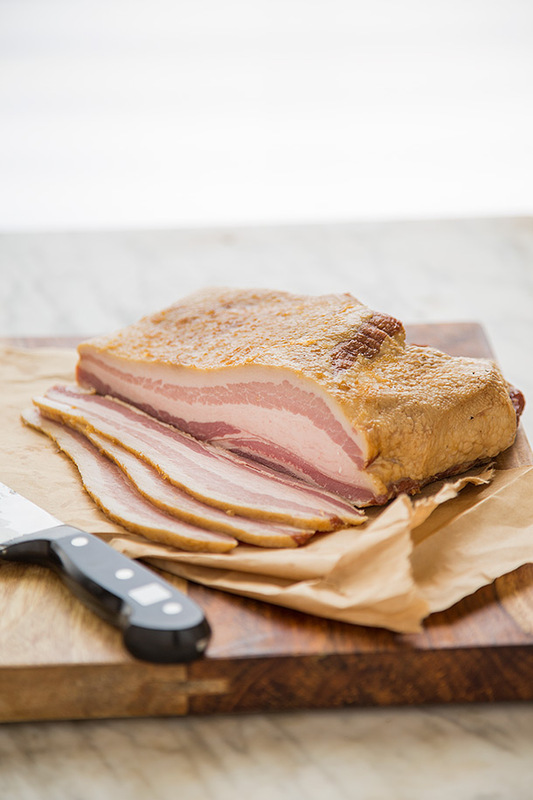 The wonderful thing about home cured bacon is that you have complete control over the ingredients that go in it. You don’t have to freak out about using sugar, nitrates or nitrites in your bacon if you choose not to have it because it’s not completely necessary, although I don’t really worry about nitrates in bacon. I did choose to use a more natural source of nitrates which was celery powder because I didn’t want to use the pink salt due to the fact that they dye it pink, although you do use it in very minimal quantities so it’s also because I’m slightly stubborn. Mainly you don’t have to worry whether or not the ingredients are Paleo of if they’re contaminated with gluten or unsavory ingredients because it’s all coming from you’re own home. Most old fashioned bacon that was made before it started being mass produced was cured with a simple mixture of salt and sometimes sugar. Now what tickles me is when someone says that they don’t want any preservatives in their bacon what so ever which is slightly an odd request because salt acts as a preservative in the making of bacon. In fact bacon is a preserved food. The whole reason that bacon was ever invented was to preserve it prior to having refrigerators. The most important thing to do when making your bacon is to make sure you use quality pork belly from a trusted source. I know many of my readers are pretty aware of where their meat comes from and have very high quality sources but it’s still an important thing to remember. Because Jason was out of pork belly I thought I wasn’t going to be able to get any for a while. That is until I went to Revival Market to meet up with my friend Charissa for lunch. Revival market it one of the only places I will eat out at because all of their meat is pastured/grassfed. Once we had eaten I grabbed a pork belly on the way out because the thought of homemeade bacon began swimming in my head again. Pork is a fairly potent source of glutamate which is what gives the meat it’s umami flavor. Now take that umami packed meat but then cure it in a combination of salt and sugar. Now you have created another; even more potent layer of umami on top of that making it twice as immersive in flavor.You know what I’m talking about; that tongue tingling salted porkiness, that alluring aroma of cured pork fat rendering in the pan. This is exactly why most people love bacon, and most vegetarians don’t even want to think about it. It truly is a one of a kind flavor that is just so powerful that it’s made irresistible to many who know the taste. And now, you know how to make it yourself. 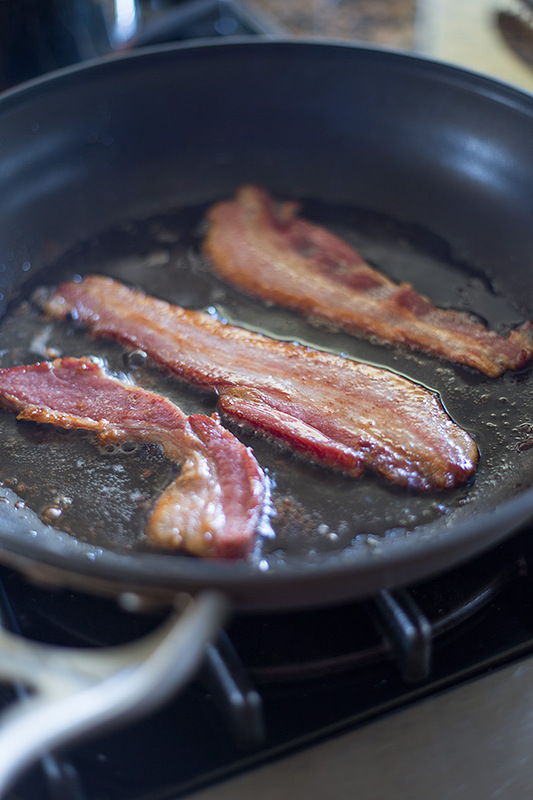 Of course I will include the obligatory shot of bacon frying in it’s own beautiful shimmering layer of fat. 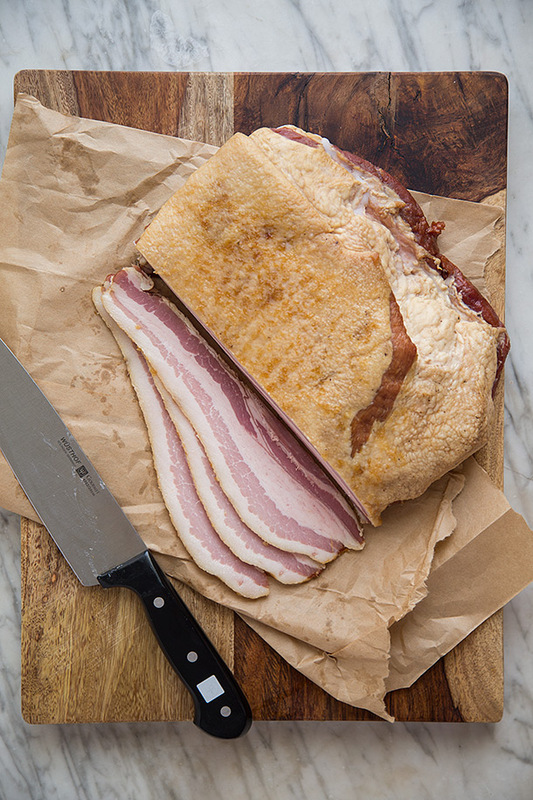 Recipe inspired by Michael Ruhlman's Home-Cured Bacon. Rinse and pat dry pork belly. In a small bowl combine salt, optional sugar, and optional celery juice powder or optional pink salt and mix well. Place the pork belly in a 2 gallon zip lock bag and coat all over and thoroughly rub with mixture. Bruise the rosemary sprigs and place all over pork belly along with garlic. Place the cure rubbed pork belly in the fridge for 7 days. Once the pork belly has cured rinse it off thoroughly with water. Soak wood 4 cups of wood chips in water for 30 mintutes. Fill 1-2 smoker boxes with ½ cup of soaked chips and a small handful of dry chips and reserve the rest of the soaked chips for later use. Remove one of the sides of the grates of the grill so that you can place the smoker boxes directly on the heating element. 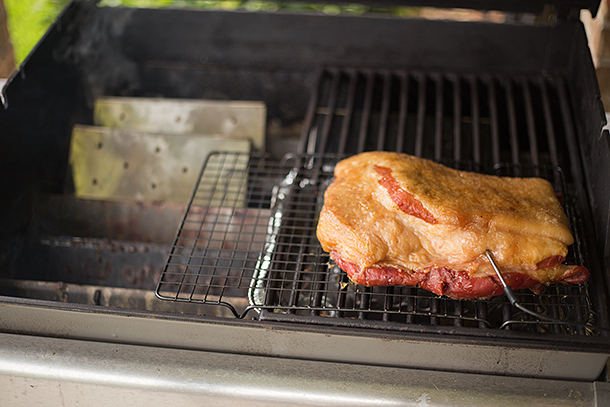 Preheat one side of the grill to medium heat keeping the opposite side completely off until the smoker boxes begin to smoke then reduce the heat to low, place the pork belly on the wire rack onto the unlit side and close the lid (see the image in my post for how I set mine up). Try to stabilize the heat at around 200 degrees and smoke the pork belly for 3½-4 hours adding more soaked chipped every 45 minutes or so; until the internal temperature of the pork belly registers 150 degrees. 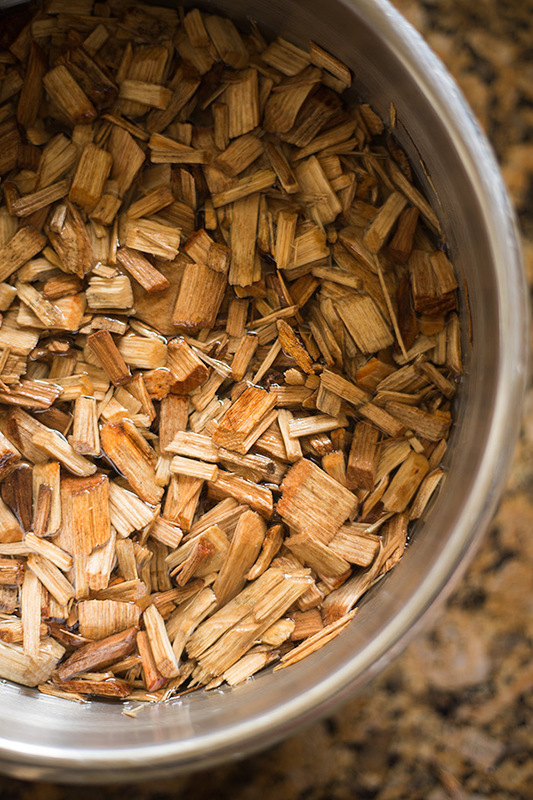 If you want more smoke without having to increase the temperature just add a small handful of dry woodchips along with the soaked. Preheat the oven to 200 degrees and place the pork belly on a wire rack on top of a baking sheet. Roast the bacon until the internal temperature of the pork belly registers 150 degrees. 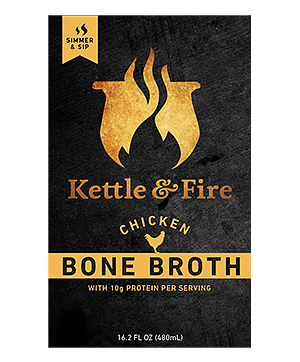 Allow to cool completely then refrigerate for at least 3 hours or up to overnight to harden the fat. With a sharp and long knife slice the bacon into desired thickness and store in the fridge for a few days or in the freezer for 6-12 months. Congratulations you have made your very own bacon. For the sugar:This is completely optional yet I chose to use coconut sugar in my recipe because the cure is washed off before it's smoked or placed in the oven which leaves insignificant and minimal quantities. 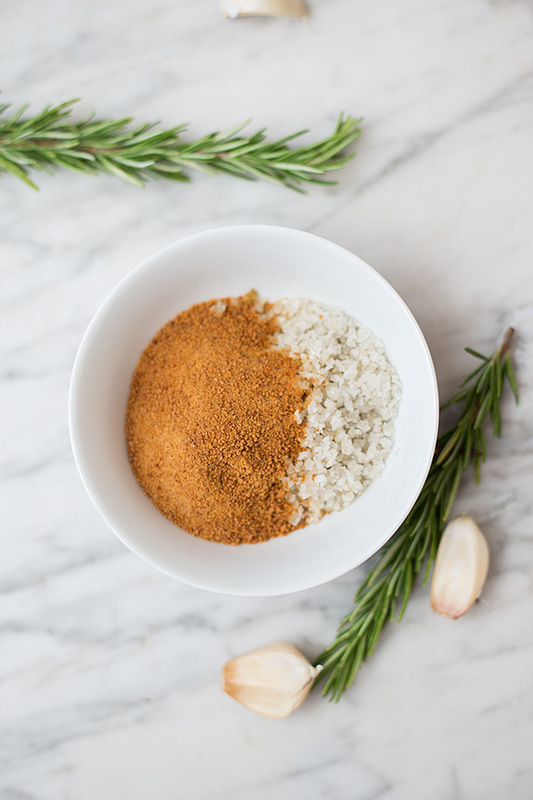 If you still do not want to use the coconut sugar then your bacon will taste a bit more salty because the sugar is in place to help contrast and tone down the saltiness. For the use of celery juice powder or pink salt: This is also optional but I chose to use celery juice powder and explained why in this post. If you don't want to use the celery juice powder or the pink salt don't worry because it's completely optional. The only difference is that your bacon might turn brown or grey after it is cured and lack the distinct piquant cured taste. If you want to learn more about the use of nitrates in cured meats and why I do not fear them Chris Kresser and Michael Ruhlman both have great articles on it. If you have a different weight of pork belly than specified: Michael Ruhlman Recommends you get the weight of the pork belly in grams and then multiply by .025 and the result of that is the amount of salt you should use in grams. This method only works if you have a food scale at home though. If you own a smoker: I do not have a smoker so I didn't try making it with one but I would imagine if you do and wanted to smoke it like that you would simply smoke it at 200 degrees away from the fire to avoid any flare ups until the pork belly internal temperature registers 150 degrees. Fry it and eat it. Savor every bite. Or you could do this. Although not recommended. Get some fresh belly from The Barry Farm and it will change your life. That’s funny, I’ve actually bought turkeys from them before. Wonderful people. I have to follow a very low salt diet for medical reasons and I’m always looking for ways to continue eating food that I used to love before I became ill. Is it possible to reduce or omit the salt and still produce bacon? You may be able to reduce the salt slightly but you cannot omit it. The salt is what helps the meat from spoiling and acts as a preservative. thanks for this fantastic post. I have a question : the temperature is fahrenheit or celsius ? Fahrenheit. Sorry for not clarifying in the recipe I’ll update it now. Oh wow! Homemade bacon, yes please!! Looks amazing. I know this is hokie but I was so excited when I began reading your post. First of all, homemade bacon. Yum! But second of all, I just discovered Yonder Way Farms. I haven’t yet contacted a local group to become part of the drop off but I’ve been strongly considering it. I saw your post pinned on Pinterest and found you that way. We must live very near each other. It’s such a small world. I just thought that was really cool! I know, hokie, but still cool! 🙂 Thank you so much for this post, too. I’ve been wanting to cure my own bacon for so long. I have always wanted to make my own bacon and looking at these beautiful pictures is making me want to try it SOON! OMG, Josh, I’ve never seen bacon look so good. And trust me, bacon always looks good. But yours? There are no words! Thanks Sonia, I’m very proud of my bacon! Can’t wait to hear how it turns out. Send in pics or link something to me so I can see the result. Good luck! I’m really happy you posted this, I too get meat from Yonderway and wanted to do something with the fresh pork belly! Thanks! Just as a note you cannot do this with sliced pork belly, it must be a solid chunk of pork belly. When you say pink salt do you know if Himalayan salt would be ok? I know you said it was optional but I heard that either the pink salt or celery powdered have to be used for the safety of the bacon. Do you know if this is so? Himalayan salt is a different kind of salt actually. When I say pink salt I’m referring to pink curing salt not Himalayan. You can buy it here. Thank you for your quick response got my pork belly fat today and now trying to find were I can find either of those local instead of waiting for delivery from somewhere to be able to start soon. You could freeze your pork belly and then order either the pink salt or the celery powder then defrost it once it gets there. Good luck and let me know how it goes. I used your bacon recipe and smoked it on Sunday. It came out great! I was wondering if you left the skin on your pork belly? I did and it came out really tough. Would u cut the skin off after smoking it? Thanks for the inspiration! I want to make bacon all the time! I do mine without the skin. I would just slice the skin off if I were you. Just make sure you don’t remove too much of the fat when removing the skin. Who knows though, the skin might get nice and crispy when fried if you don’t want to remove it. The skin did crisp up a bit but it was still pretty tough. I’m going to cut it off next time and make some pork rinds. Thanks! Do you leave the bacon in the Ziploc bag when you place it in the fridge to cure? Regarding the skin….. I have been curing it with the skin on. After a week or so I remove the skin and cover that side with cracked black pepper or maple syrup powder or whatever seasonings you like. Then I smoke it. The skin is great in beans and stuff. 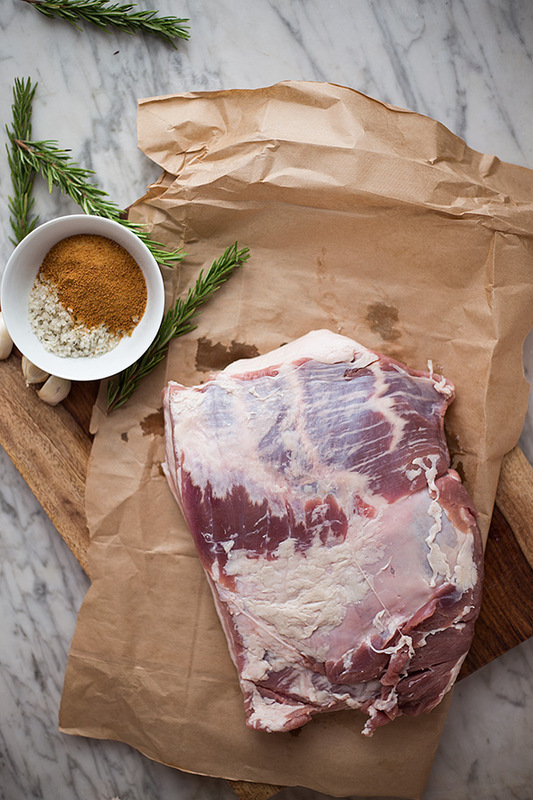 Also try wrapping a pork loin in it (the skin) before you cook it…. Looks wonderful! Have you tried the US Wellness bacon?? I’m wondering if it’s good. I’m sure not as good as your’s though. I have tried the US Wellness bacon and it’s quite good but I prefer my own bacon. I have an excellent local source for meats. Granted I still grab some of the harder to find cuts of beef and some duck from US Wellness. 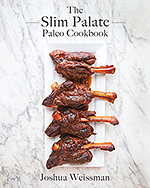 I, too, was inspired by Mr. Ruhlman to start making my own bacon several years ago. After Modernist Cuisine was released, I switched to their house cure recipe and I find their addition of star anise to be a powerful (and unexpected) pork flavor booster. Now that I am spoiled and cannot return to store-bought bacon, I got a six rack smoker so I can make 50 lbs. 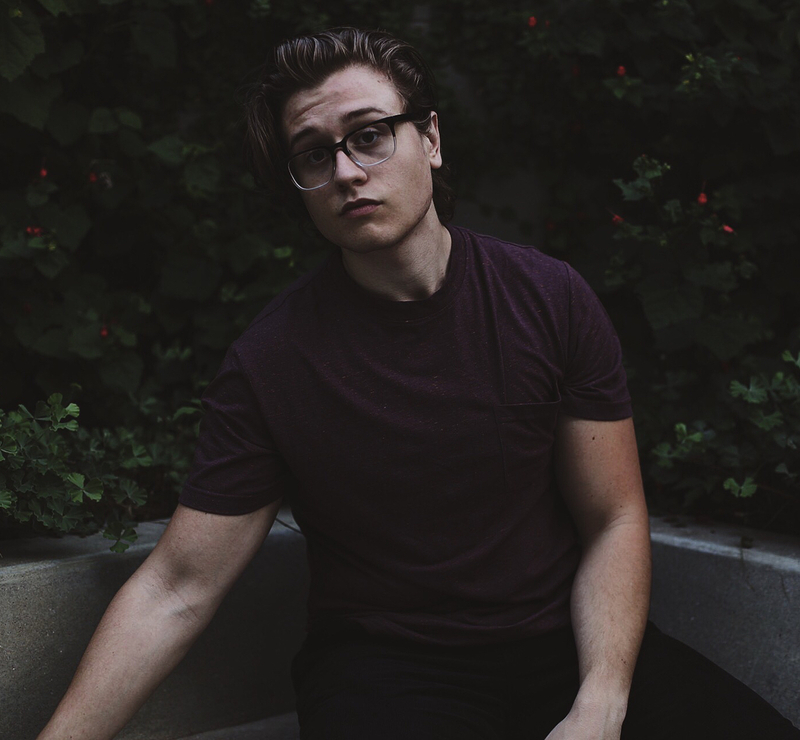 at a time. Thank goodness bacon freezes so well (and a local butcher lets me use his slicer and chamber vacuum sealer). I always love the seemly necessary inclusion of vegetarians while reading these types of articles and how they’ll feel, think and act about topics such as bacon. There isn’t any amount of shame that applies to the favor toward eating meat as much as there is a favor applied to a great crop of artichokes or asparagus. I wouldn’t be surprised to find a question asking about a substitute for pork belly but of course there is not one and there never will be and I am thankful for that. Great article. I’ve made my own bacon a few times now and it seems to come out similar to ham. Yes I know they’re both pig. But bacon from the store is typically softer where mine has been more firm. Yours seemed similar. I don’t mind but wondered if someone knew why? Thanks! I purchased 2 packets of sliced uncured bacon at a farmers market to my dismay it didn’t taste like my usual store bought nitrate free bacon. It tasted like a pork chop. Is there anything I can easily do with the slices to make them taste more interesting? Tried this and it came out fantastic. We had some Applewood to use when we smoked it, oh yum! Thank you for the recipe, it is my third time trying to make bacon, and it was nice to finally have success. (to be fair, was using pre-sliced pork belly before which was one problem of several..lol).